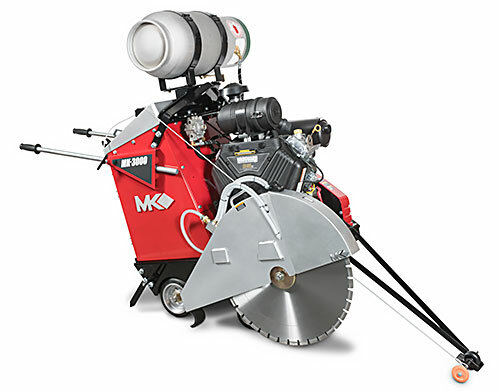 The MK-3000 series Concrete Saws are big performance saws in small packages. They have been engineered to take advantage of the new breed of high horsepower V-Twin air-cooled engines from Briggs and Stratton and Kohler. They provide the cutting depth and power of traditional street saws with all the advantages of a smaller, more maneuverable saw. The saws are fully self-propelled and use an electric leadscrew to raise and lower the blade. One-year limited warranty. The Briggs & Stratton Vanguard 33Hp, air cooled, v-twin horizontal shaft engine is the industry proven standard for Big Block engine power, performance and reliability. Features include Dura-Bore cast iron cylinder sleeves and a high efficiency OHV head design for improved efficiency, smoother idle, lower emissions and more power. Magnetron electronic ignition provides dependable starts with no required maintenance. Depth of Cut - 20" Blade 7-1/2"
Depth of Cut - 26" Blade 10-1/2"
Depth of Cut - 30" Blade 12-1/2"
L x W x H 50" x 30-1/2" x 44"